Thirteen-time U.S. champion Katie Compton wins Pan-American cyclocross championships in Louisville with a convincing solo ride. 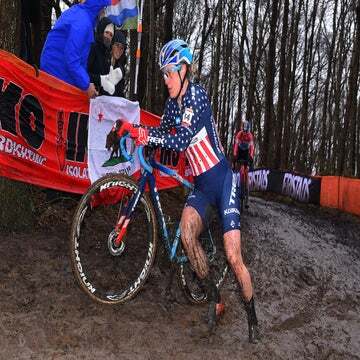 LOUISVILLE, Kentucky (VN) — Thirteen-time U.S. national champion Katie Compton won the Pan-American cyclocross championships Sunday in Louisville with another convincing solo ride. 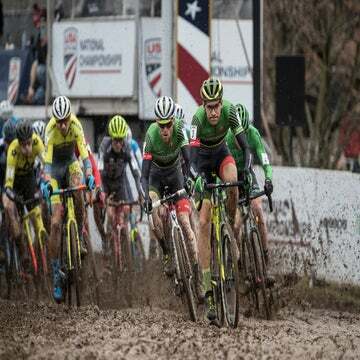 As she did on Saturday in the US Cup-CX/Derby City, the KFC Racing-Trek-Panache rider dispatched Cannondale-CyclocrossWorld.com’s Kaitie Keough midway through the race. Canadian Christel Ferrier-Bruneau (Sas Macogep Aquisio) was third. On the first lap, the eventual podium finishers formed a group with Compton leading the way. With gusty winds blowing and the course beginning to dry out, it was advantageous to sit in the draft on some sections. “It was a lot tackier but the ruts were a little deeper than yesterday and softer and the ground was a lot bumpy,” said Courtenay McFadden (Pivot Cycles). After two laps, Ferrier-Bruneau was dropped. Behind, Rebecca Fahringer (Stans NoTubes), McFadden, and Ellen Noble (Aspire Racing) sparred for fourth and fifth place. Compton was keeping an eye on Ferrier-Bruneau, after racing with her in Europe over the years. On the third lap, Keough bobbled on the course’s most difficult off-camber section. This gave Compton the advantage she needed to punch the accelerator. The U.S. champ extended her lead. Behind, Keough and Ferrier-Bruno rode their own races to finish second and third, respectively. McFadden attacked Fahringer with a lap and a half to go after Noble had faded from the picture. McFadden held on to take fourth. 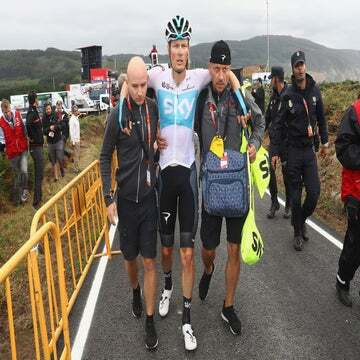 Fahringer was fifth. “I know she climbs better than I do, she always has,” Compton added. “She’s also a good descender too. I’m a little faster there, so I kind of have to pick and chose. Like Keough, Compton recognized that the mid-race off-camber section was key to her victory. Despite feeling a bit of regret over the mistake, Keough was pleased with her result. “I’m proud of myself,” Keough added. “That’s the closest I’ve ever been when it’s just one-on-one like that with her. I think I could have been there I just didn’t ride a clean race.